Back in the 1970s Monty Python did a great sketch about marauding old ladies kicking in passers-by and hanging around on street corners. 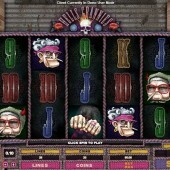 The Hells Grannies, as they were called, remain one of the comedy troupe's funniest creations, and slot developer Microgaming have got in on the theme with a cracking slot full of heavy metal, blue rinses and fast action. In this 5 reel, 25 pay-line slot, a very cosy take on the world of Harleys and biker bars has a great game screen – here ‘knitted’ rather than designed – and some hilarious icons like the tattoo’d knuckles reading ‘GRAN...NIES’, the cigarette-smoking old girls, 9-through-Ace symbols, and best of all, the crocheted quilt reading, ‘Knit Fast, Die Warm’. It’s that great slogan that acts as the game’s Wild, substituting for all regular symbols other than the Hells Grannies icon. 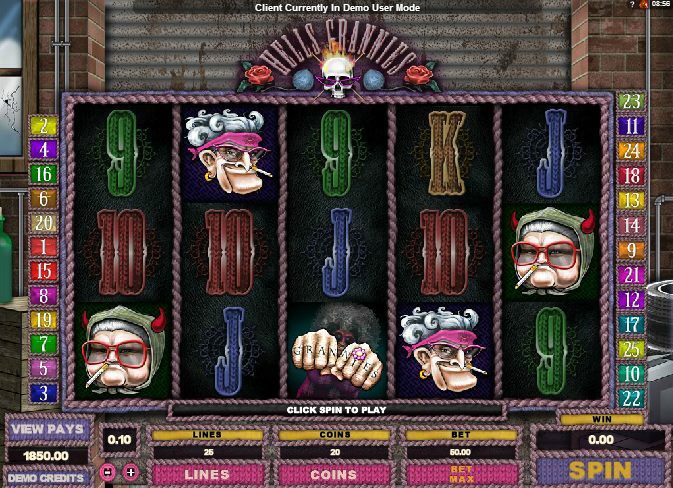 Three, four or five Hells Grannies logos will trigger the free spins bonus game. First, you’ll have to spin the Wheel of Fortune to ascertain how many spins you receive. Spin the wheel once to see what you get, and what multiplier applies to them. The most that can be won is 20 free spins with 3x multipliers which play immediately after the wheel has stopped. There’s no doubting the style and humor here, with Microgaming pushing their boat out in the comedy stakes. You almost think you’re in a Sheriff Gaming slot or Betsoft Gaming slot with the number of jokes banded about. As for other Hell’s Angels-related slots on the market, check out the aforementioned Betsoft's stunning 3D game Slots Angels; it has a more traditional take on the legendary road warriors, with Harley Davidson motorbikes, hot girls and long, open roads. Elsewhere, iSoftBet’s similarly comedic take on the motorbiking fraternity, Motorbike Monkey – with its 1000x bet jackpot – is certainly worth a gander.